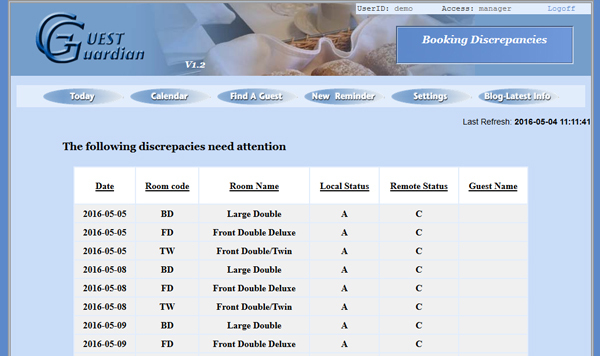 The diary compare tool was introduced some time ago, which is where GG will check it's diary against an external booking system (such as FreeToBook) and will display a list of discrpancies if any found. The discrepancy display page has now been updated to include a "Refresh" button which will cause the diary compare to re-run against the external booking system. This allows the system to be checked once the user is sure they have corrected all the problems. 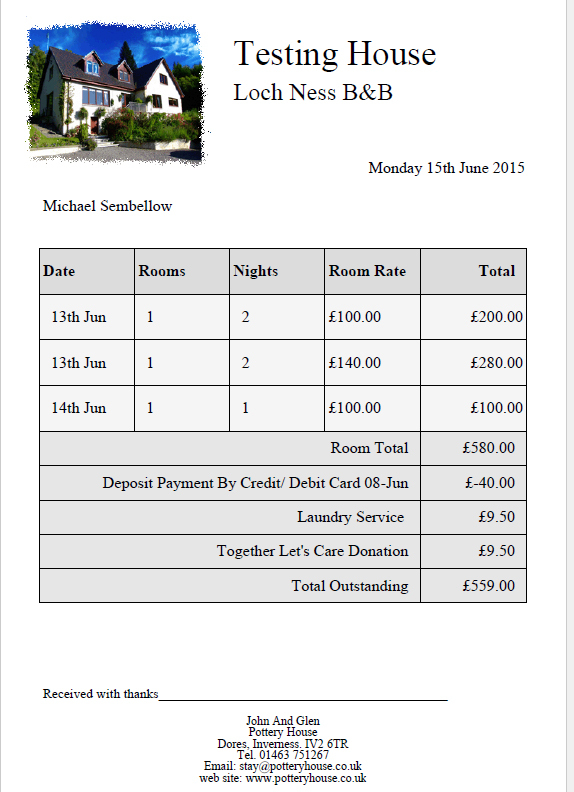 On a new booking, the options are now available to process the deposit or the whole amount. It's now possible to charge the balance to the guests card registered at booking, from the show guest screen, using the Pay Balance button on the Booing details section. 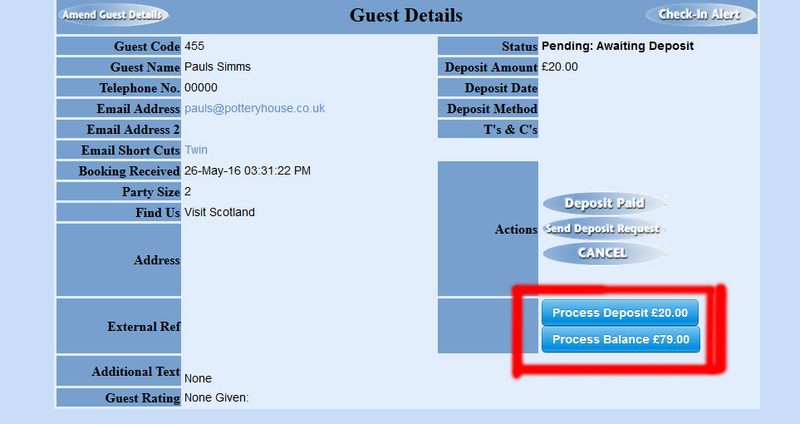 On clicking the "Pay Balance" button you will be asked to confirm the charge before the payment is processed. Any refunds processed through Stripe will now be automatically notified to Guest Guardian. 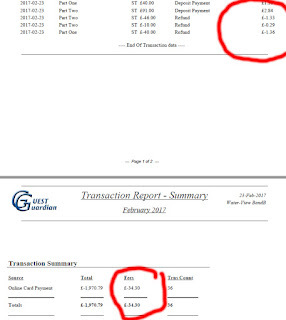 The refund will appear in the audit trail and the month end report, including the refund fee (see below). 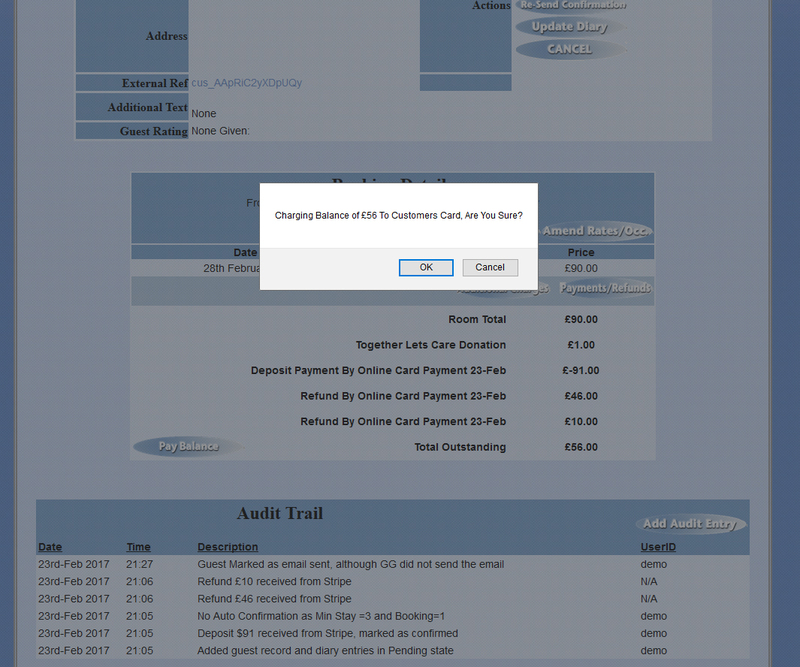 All Stripe fee charges will now be tracked and will appear on the month end report. 2 Major enhancements have been implemented into Guest Guardian, as follows. 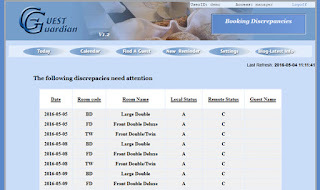 Having multiple booking systems leaves businesses open to the danger of double booking. To help prevent this GG now has an ICA calendar checker which works like this. Once a day GG will pull in ICA calendars from a specified booking engine and run a comparison of blocked rooms against its own diary. If a discrepancy is found a message will appear on the Todo List as shown. To ignore the discrepancies click "(REMINDER)" to remove the entry from the Todo List, if discrepancies still exist this entry will re-appear the following day. 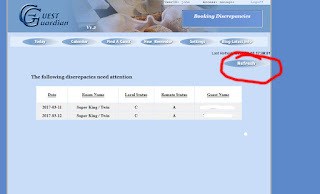 To display the discrepancies list click the tick box on the message and the following panel will appear. You can then go through the list and check each problem and adjust either calendar as required. 2) Multiple Text For Cancellations. When a booking is cancelled the user has the option of generating an email to the original booking email address confirming the cancellation. Previously there was 1 single email text. This change implements the ability to create a different email text for each cancellation type as defined in the system parameter file, parameter type CR. If no text is found then the default cancellation email text is used. For example: If you have a cancellation defined as "CR02: No Deposit" you can then create an email text file with the suffix 02 and this will be used each time a booking/reservation is cancelled with this cancellation type. 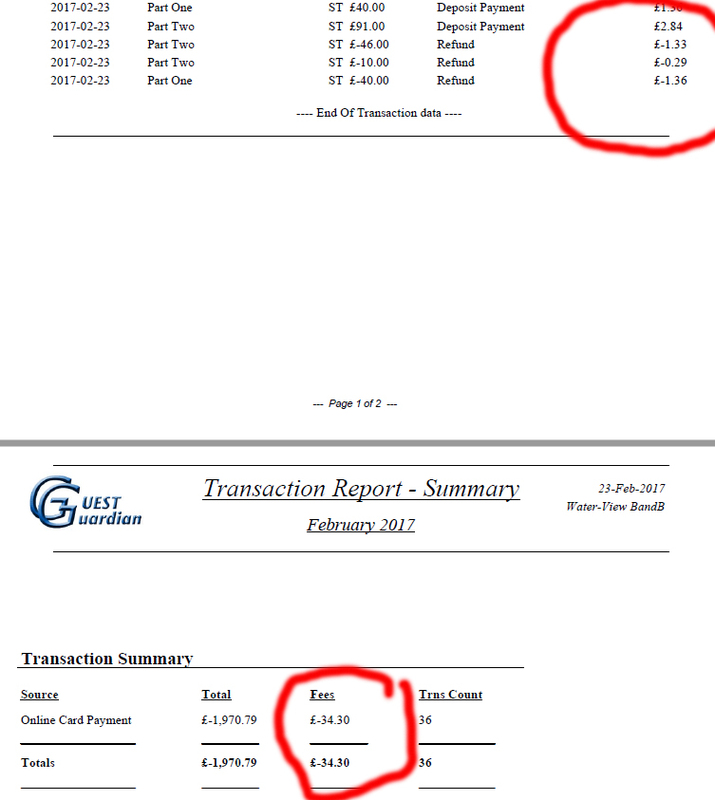 Previously, GG bills where priced using the "per person per night" room rate, however this is old fashioned and most businesses charge by the room. GG now produces bills charging by the room as shown below. 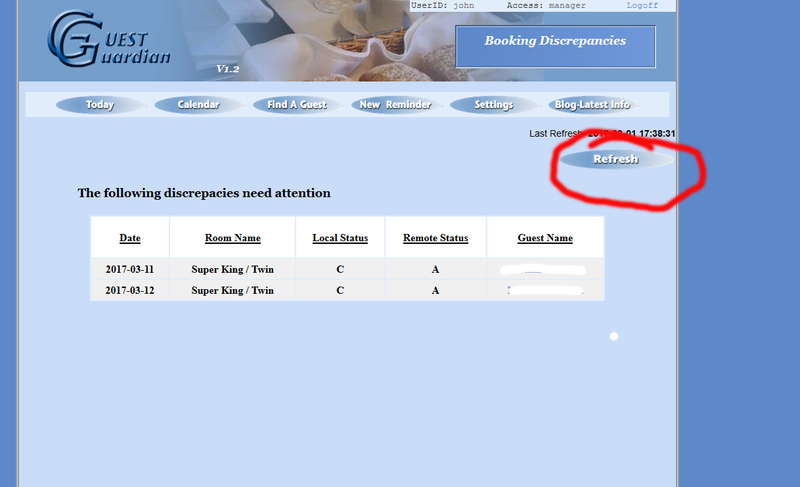 Go onto the guest booking screen then click "Adjust rate/occ." button and then amend the room price as appropriate. Leave the standard room rate in place and apply a single occupancy discount by clicking the "additional charges" button and creating a negative single occupancy charge. Where a extra person is in a room this is processed the same as No.2 above only a positive charge is applied. 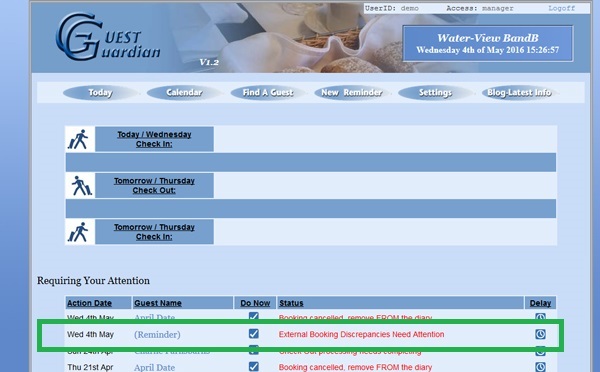 Guest Guardian now has an ICA calendar export system, to enable availability to be automatically synchronised with ICA Calendar compatibly booking systems, such as Airbnb. 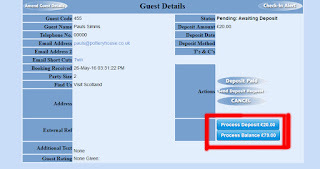 The interface allows external booking systems to simply pull down the current availability whenever required. For Airbnb this is set up by simply defining the Interface for each room/listing. Airbnb will then automatically update it's calendars every 6 hours. Each time a sync call is made by the external system it will be recorded in the audit trail.